Once Upon a Time in the West (Italian: C’era una volta il West) is a 1968 epic Spaghetti Western film co-written and directed by Sergio Leone. It stars Henry Fonda, cast against type, as the villain, Charles Bronson as his nemesis, Claudia Cardinale as a newly widowed homesteader, and Jason Robards as a bandit. The screenplay was written by Sergio Donati and Leone, from a story by Dario Argento, Bernardo Bertolucci and Leone. The widescreen cinematography was by Tonino Delli Colli, and the acclaimed film score was by Ennio Morricone. After directing The Good, the Bad and the Ugly, Leone decided to retire from Westerns and desired to produce his film based on The Hoods, which eventually became Once Upon a Time in America. However, Leone accepted an offer from Paramount Pictures to provide access to Henry Fonda and to use a budget to produce another Western film. He recruited Bertolucci and Argento to devise the plot of the film in 1966, researching other Western films in the process. After Clint Eastwood turned down an offer to play the movie’s protagonist, Bronson was offered the role. During production, Leone recruited Donati to rewrite the script due to concerns over time limitations. The original version by the director was 166 minutes (2 hours and 46 minutes) when it was first released on December 21, 1968. This was the version that was to be shown in European cinemas and was a box office success. For the US release on May 28, 1969, Once Upon a Time in the West was edited down to 145 minutes (2 hours and 25 minutes) by Paramount and was a financial flop. The film is considered by some to be the first installment in Leone’s Once Upon a Time Trilogy, followed by Duck, You Sucker!, called Once Upon a Time… the Revolution in parts of Europe, and Once Upon a Time in America, though the films do not share any characters in common. In 2009, the film was selected for preservation in the United States National Film Registry by the Library of Congress as being “culturally, historically or aesthetically significant”. The film portrays two conflicts that take place around Flagstone, a fictional town in the American Old West: a land battle related to construction of a railroad, and a mission of vengeance against a cold-blooded killer. A struggle exists for Sweetwater, a piece of land in the desert outside Flagstone which contains the region’s only other water source. The land was bought by Brett McBain (Frank Wolff), who foresaw that the railroad would have to pass through that area to provide water for the steam locomotives. When crippled railroad tycoon Morton (Gabriele Ferzetti) learns of this, he sends his hired gun Frank (Henry Fonda) to intimidate McBain to move off the land, but Frank instead kills McBain and his three children, planting evidence to frame the bandit Cheyenne (Jason Robards). Meanwhile, a former prostitute (Claudia Cardinale) arrives at Flagstone from New Orleans, revealing that she is McBain’s new wife and therefore owner of the land. The film had opened with a mysterious harmonica-playing gunman (Charles Bronson), whom Cheyenne later dubs “Harmonica”, shooting three men sent by Frank to kill him. In a roadhouse on the way to Sweetwater, where he also encounters Mrs McBain, Harmonica informs Cheyenne that the three gunfighters appeared to be posing as Cheyenne’s men. Cheyenne arrives at Sweetwater soon after and both men seem attracted to Mrs McBain. Harmonica explains that, according to the contract of sale, she will lose Sweetwater unless the station is built by the time the track’s construction crews reach that point, so Cheyenne puts his men to work building it. Frank turns against Morton, who wants to make a deal with Mrs McBain, and immobilises him under guard on his private train out in the desert. Instead Mrs McBain allows Frank to seduce her, seemingly to save her life, and is then forced to sell her property in an auction where Frank’s men intimidate the other bidders. Harmonica disrupts Frank’s plan to keep the price down when he arrives, holding Cheyenne at gunpoint, and makes a much higher bid with the reward money for the wanted Cheyenne. But as Cheyenne is placed on a train bound for the Yuma prison, two members of his gang purchase one-way tickets for the train, intending to help him escape. Morton now pays Frank’s men to turn against him. However, Harmonica helps Frank kill them by directing his attention to their whereabouts from the room where Mrs McBain is taking a bath – to her outrage. On Frank’s return to Morton’s train he finds that Morton and his remaining men have been killed in a battle with Cheyenne’s gang. Frank then goes to Sweetwater to confront Harmonica. On two occasions, Frank has asked him who he is, but both times Harmonica only answered with names of men “who were alive before they knew you”. This time, Harmonica says he will reveal who he is “only at the point of dying”. As the two prepare for a gun duel, Harmonica’s motive is revealed in a flashback. A younger Frank forces a boy to support his older brother on his shoulders, while his brother’s neck is in a noose strung from an arch. As the boy struggles to hold his brother’s weight, Frank stuffs a harmonica into the panting boy’s mouth. The older brother curses Frank and the boy (who has grown up to be Harmonica) collapses to the ground. Back in the present, Harmonica draws first and stuffs his instrument into the dying Frank’s mouth as a reminder. At the house again, Harmonica and Cheyenne say goodbye to Mrs McBain, who is supervising construction of the railway station as the track-laying crews reach Sweetwater. As the two men ride off, Cheyenne falls, admitting that he was mortally wounded by Morton during the fight with Frank’s gang. While Harmonica rides away with Cheyenne’s dead body, the work train arrives and Mrs McBain carries water to the rail workers. With the death of Gabriele Ferzetti in 2015, Claudia Cardinale is the sole surviving member of the film’s main cast. After making his American Civil War epic The Good, the Bad and the Ugly, Leone had intended to retire from making Westerns, believing he had said all he wanted to say. He had come across the novel The Hoods by the pseudonymous “Harry Grey”, an autobiographical book based on the author’s own experiences as a Jewish hood during Prohibition, and planned to adapt it into a film (this would eventually, seventeen years later, become his final film, Once Upon a Time in America). Leone though was offered only Westerns by the Hollywood studios. United Artists (who had produced the Dollars Trilogy) offered him the opportunity to make a film starring Charlton Heston, Kirk Douglas and Rock Hudson, but Leone refused. However, when Paramount offered Leone a generous budget along with access to Henry Fonda—his favorite actor, and one whom he had wanted to work with for virtually all of his career—Leone accepted the offer. Leone commissioned Bernardo Bertolucci and Dario Argento—both of whom were film critics before becoming directors—to help him develop the film in late 1966. The men spent much of the following year watching and discussing numerous classic Westerns such as High Noon, The Iron Horse, The Comancheros, and The Searchers at Leone’s house, and constructed a story made up almost entirely of “references” to American Westerns. Ever since The Good, the Bad and the Ugly, which originally ran for three hours, Leone’s films were usually cut (often quite dramatically) for box office release. Leone was very conscious of the length of Once Upon a Time in the West during filming and later commissioned Sergio Donati, who had worked on several of Leone’s other films, to help him refine the screenplay, largely to curb the length of the film towards the end of production. Many of the film’s most memorable lines of dialogue came from Donati, or from the film’s English dialogue adapter, expatriate American actor Mickey Knox. For Once Upon a Time in the West, Leone changed his approach over his earlier Westerns. Whereas the “Dollars” films were quirky and up-tempo, a celebratory yet tongue-in-cheek parody of the icons of the Wild West, this film is much slower in pace and sombre in theme. Leone’s distinctive style, which is very different from, but very much influenced by, Akira Kurosawa‘s Sanshiro Sugata (1943), is still present but has been modified for the beginning of Leone’s second trilogy, the so-called Once Upon a Time Trilogy. The characters in this film are also beginning to change markedly over their predecessors in the Dollars Trilogy. They are not quite as defined and, unusual for Leone characters up to this point, they begin to change (or at least attempt to) over the course of the story. This signals the start of the second phase of Leone’s style, which would be further developed in Duck, You Sucker! and Once Upon a Time in America. Most of the film was shot in Cinecittà studios, Rome. The brick arch where Bronson’s character flashbacks to his youth and the original lynching incident was built near a small airport fifteen miles north of Monument Valley, in Utah and two miles from U.S. Route 163 (which links Gouldings Lodge and Mexican Hat). The opening sequence with the three gunmen meeting the train was one of the sequences filmed in Spain. Shooting for scenes at Cattle Corner Station, as the location was called in the story, was scheduled for four days and was filmed at the ‘ghost’ train station in the municipality of La Calahorra, county of Gaudix, near Guadix, in the Province of Granada, Spain, as were the scenes of Flagstone, and shooting for the scenes in the middle of the railway were filmed along the Guadix – Hernan Valle railway line. When he accepted the role, Fonda came to the set with brown contacts and facial hair. Fonda felt having dark eyes and facial hair would blend well with his character’s evil and also help the audience to accept this “new” Fonda as the bad guy, but Leone immediately told him to remove the contacts and facial hair. Leone felt that Fonda’s blue eyes best reflected the cold, icy nature of the killer. It was one of the first times in a Western film where the villain would be played by the lead actor. Robert Ryan was offered the role of the Sheriff played by Keenan Wynn. Ryan initially accepted, but backed out after being given a larger role in Sam Peckinpah‘s The Wild Bunch. Enrico Maria Salerno and Robert Hossein were both offered the role of Morton before Gabriele Ferzetti was cast; Hossein had accepted, but had to drop out for a theatre commitment. Ferzetti, who considers it one of his best roles, referred to his casting as “Fate, Destiny” in an interview for the DVD release. Actor Al Mulock (featured as Knuckles in the opening train sequence, as well as in Leone’s The Good, the Bad and the Ugly) committed suicide during shooting of the film by leaping from his Guadix hotel room in full costume. Frank Wolff, the actor who plays McBain, also committed suicide in a Rome hotel in 1971. 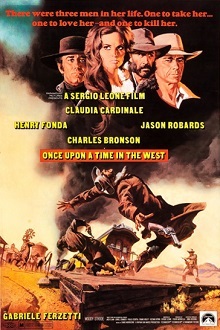 Following the film’s completion, Once Upon a Time in the West was dubbed into several languages, including Italian, French, German, Spanish and English. For the English dub, the voices of much of the American cast, including Fonda, Bronson, Jason Robards, Jack Elam, Wynn, Wolff and Lionel Stander, were used. However, the rest of the cast had to be dubbed by other actors, including Ferzetti, who was dubbed by actor Bernard Grant (who is believed to have voiced Gian Maria Volontè and Aldo Giuffrè in the Dollars Trilogy), and Claudia Cardinale, who was voiced by Grant’s wife, Joyce Gordon. Except for about a minute of the “Judgment” motif, before Harmonica kills the three outlaws, no soundtrack music is played until at the end of the second scene, when Henry Fonda makes his first entry. During the beginning of the film, Leone instead uses a number of natural sounds, for instance a turning wheel in the wind, sound of a train, grasshoppers, shotguns while hunting, wings of pigeons, etc., in addition to the diegetic sound of the harmonica. Once Upon a Time in the West was reviewed in 1969 in the Chicago Sun-Times by Roger Ebert, who gave it two-and-a-half out of four stars. He found it to be “good fun” and “a painstaking distillation” of Leone’s famous style, with intriguing performances by actors cast against their type and a richness of detail projecting “a sense of life of the West” made possible by Paramount’s bigger budget for this Leone film. Ebert complained, however, of the film’s length and convoluted plot, which he said only becomes clear by the second hour. While viewing Cardinale a good casting choice, he said she lacked the “blood-and-thunder abandon” of her performance in Cartouche (1962), blaming Leone for directing her “too passively”. In subsequent years, the film developed a greater standing among critics as well as a cult following. Directors such as Martin Scorsese, George Lucas, Quentin Tarantino, and Vince Gilligan have cited the film as an influence on their work. It has also appeared on prominent all-time critics lists, including Time magazine’s 100 greatest films of the 20th century and Empire‘s 500 greatest movies of all time, where it was the list’s highest-ranking Western at number 14. Popular culture scholar Christopher Frayling regarded it as “one of the greatest films ever made”. In They Shoot Pictures, Don’t They’s list of the 1000 Greatest Films, Once Upon a Time in the West is placed at number 62. In 2008, Empire held a poll of “The 500 Greatest Movies of All Time”, taking votes from 10,000 readers, 150 filmmakers and 50 film critics. “Once Upon a Time in the West” was voted in at number 14, the highest Western on the list. In 2013, The Guardian ranked it #1 in its “Top 10 movie westerns” list. The movie was a massive hit in France, and was easily the most successful film released there in 1969 with 14.8 million admissions, ranking 7th of all time. It sparked a brief fashion trend for duster coats which took such proportions that Parisian department stores such as Au Printemps had to affix signs on escalators warning patrons to keep their “maxis,” as they were called, clear from the edges of moving steps to prevent jamming. The entire scene at Lionel Stander‘s trading post. Cheyenne (Robards) was not introduced in the American release until his arrival at the McBain ranch later in the film. Stander remained in the credits, even though he did not appear in this version at all. Morton’s death scene was reduced considerably. Cheyenne’s death scene was completely excised. Following the opening duel (where all four gunmen fire and fall), Charles Bronson’s character stands up again showing that he had only been shot in the arm. This part of the scene had been originally cut by director Sergio Leone for the worldwide theatrical release. It was added again for the U.S. market because the American distributors feared American viewers would not understand the story otherwise, especially since Harmonica’s arm wound is originally shown for the first time in the scene at the trading post which was cut for the shorter U.S. version. In Italy, a 175-minute director’s cut features a yellow tint filter, and several scenes augmented with additional material. This director’s cut was released on home video until the early 2000s, and still airs on TV, but more recent home video releases have used the international cut. After years of public requests, Paramount released a 2-Disc “Special Collector’s Edition” of Once Upon a Time in the West on November 18, 2003, with a running time of 165 minutes (158 minutes in some regions). This release is the color 2.35:1 aspect ratio version in anamorphic wide-screen, closed captioned and Dolby. Commentary is also provided by film experts and historians including John Carpenter, John Milius, Alex Cox, film historian and Leone biographer Sir Christopher Frayling, Dr. Sheldon Hall, as well as actors Claudia Cardinale and Gabriele Ferzetti, and director Bernardo Bertolucci, a co-writer of the film. Leone’s intent was to take the stock conventions of the American Westerns of John Ford, Howard Hawks and others, and rework them in an ironic fashion, essentially reversing their intended meaning in their original sources to create a darker connotation. The most obvious example of this is the casting of veteran film good guy Henry Fonda as the villainous Frank, but there are also many other, more subtle reversals throughout the film. According to film critic and historian Christopher Frayling, the film quotes from as many as 30 classic American Westerns. Johnny Guitar (1954): Jill and Vienna have similar backstories (both are former prostitutes who become saloonkeepers), and Harmonica, like Sterling Hayden‘s title character, is a mysterious, gunslinging outsider known by his musical nickname. Some of West’s central plot (Western settlers vs. the railroad company) may be recycled from Nicholas Ray’s film. The Searchers (1956): Leone admitted that the rustling bushes, the silencing of insect sounds, and the fluttering grouse that suggest menace approaching the farmhouse when the McBain family is massacred were all taken from The Searchers. The ending of the film—where Western nomads Harmonica and Cheyenne move on rather than join modern society—also echoes the famous ending of Ford’s film. Winchester ’73 (1950): It has been claimed that the scenes in West at the trading post are based on those in Winchester ’73, but the resemblance is slight. Jump up^ The 7-minute regional variation in DVD running time is due to the 4% speed difference between the 24 fps NTSC and 25 fps PAL video formats. There is no difference in content. Jump up^ “Box Office Information for Once Upon a Time in the West“. The Numbers. Archived from the original on 5 July 2014. Retrieved September 12, 2013. ^ Jump up to:a b “Top 100 Deutschland”. Retrieved March 15, 2018. Jump up^ “C’era una volta il West”. Wikipedia (in Italian). 2016-10-18. Jump up^ Corliss, Richard (25 April 2007). “Top 25 Greatest Villains – Henry Fonda as Frank”. Time. Time Inc. Retrieved 8 April2016. ^ Jump up to:a b “25 new titles added to National Film Registry”. Yahoo News. Yahoo. Associated Press. 2009-12-30. Archived from the original on January 6, 2010. Retrieved 2009-12-30. Jump up^ La Repubblica. “Addio a Gabriele Ferzetti, il seduttore introverso del nostro cinema”. Retrieved 2 December2015. Jump up^ Kiral, Cenk (April 9, 1998). “An Exclusive Interview With Mickey Knox”. Fistful-of-leone.com. Retrieved 2011-06-12. Jump up^ Frayling, Christopher (2012). Sergio Leone: Something to do with Death. University of Minnesota Press. p. 296. ISBN 9780816646838. Jump up^ “La Calahorra, una estación de cine para los ‘western’ españoles”, 20 Minutos, 1 March 2013 (in Spanish). Accessed 17 March 2017. Jump up^ “Estados Unidos en Granada. La Calahorra: escenario de WEsterns”, Guía Repsol, 10 October 2015 (in Spanish). Accessed 17 March 2017. Jump up^ “Location Filming for Once Upon A Time in the West”. Fistfuloflocations.com. Retrieved 2011-06-12. Jump up^ Howard Hughes (2007). Stagecoach to Tombstone: The Filmgoers’ Guide to the Great Westerns. I.B.Tauris & Co Ltd. ISBN 9781845115715. p.166. ^ Jump up to:a b Kehr, Dave (2011). “Once Upon a Time in the West”. When movies mattered : reviews from a transformative decade. Chicago: University of Chicago Press. ISBN 978-0-226-42941-0. Jump up^ Ebert, Roger (June 6, 1969). “Once Upon a Time in the West (1969)”. Chicago Sun-Times. Retrieved September 1, 2018. Jump up^ Mathijs, Ernest; Sexton, Jamie (2012). “Cult Pastiche”. Cult Cinema: An Introduction. John Wiley & Sons. ISBN 1444396439. ^ Jump up to:a b Snider, Eric (April 19, 2012). “My Shame List: Once Upon a Time in the West (1968)”. MTV. Retrieved September 1, 2018. Jump up^ “Breaking Bad Series Creator Vince Gilligan Answers Viewer Questions”. AMC.com. Retrieved 16 March 2017. Jump up^ Frayling, Christopher (2005). Once Upon a Time in Italy: The Westerns of Sergio Leone. Harry N. Abrams. ISBN 0810958848. Jump up^ “Time Magazine’s All-Time 100 Movies | The Moving Arts Film Journal”. Themovingarts.com. Archived from the original on 2013-01-22. Retrieved 2013-01-08. Jump up^ “TSPDT – 1,000 Greatest Films (Full List)”. Theyshootpictures.com. Retrieved 2013-02-18. Jump up^ “100 Greatest Movies of All Time”. Drskantze.com. Retrieved 2013-02-18. Jump up^ “Empire’s 500 Greatest Movies Of All Time”. Empireonline.com. 2006-12-05. Retrieved 2013-01-08. Jump up^ The Guardian (2013). “Top 10 movie westerns”. Retrieved 5 February 2018. Jump up^ “The 100 best action movies”. Time Out. Retrieved November 7, 2014. Jump up^ “Archived copy”. Archived from the original on 2015-07-28. Retrieved 2015-08-06. Jump up^ “AFI’s 100 Years…100 Heroes & Villains Nominees”(PDF). Retrieved 2016-08-06. Jump up^ “AFI’s 100 Years of Film Scores Nominees” (PDF). Retrieved 2016-08-06. Jump up^ “Top250 Tous Les Temps En France (reprises incluses)”. Retrieved March 15, 2018. Fawell, John (2005). The Art of Sergio Leone’s Once Upon a Time in the West: A Critical Appreciation. Jefferson, N.C.: McFarland. ISBN 0-7864-2092-8.